The fans and Fan holder Frame bracket kit is special made to hold 1, 2 fans or 3 fans if needed, the picture shows 3 fans, but only 2 fans comes in the kit. This kit will work with any Dometic refrigerator. Since this is not a OEM style it may in some cases need a little tweaking to mount. Never had a customer not be able to mount, wire, and use as the install is simple. The more air flow through the condenser fins, the faster and colder the cooling unit will keep your food zone of your RV refrigerator. The bracket is made to mount in any needed way, on any RV Refrigerator to hold your added fans. It will also have a loose extend plate with the main bracket holder, so it can be used for the larger 4 Door refrigerators, to the small single door, Large side by side, and double door units. Kit will have a 2 stage switch, fan runs during day, if temps are above 85, and will be off during the night with cooler night temps. 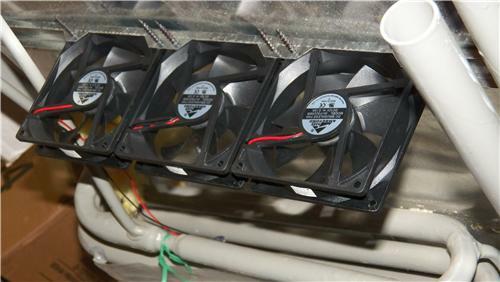 We have additional fan for mounting if you want the 3rd fan or you can use any brand or style, it's your choice.